The arrival of the Budweiser plant in north Van Nuys proved that the San Fernando Valley has a taste for more than Owens River water. 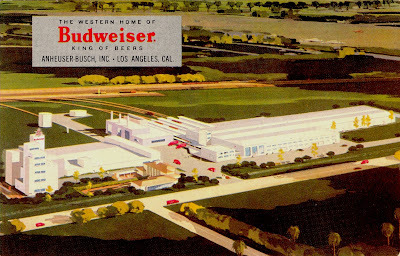 The western home of Budweiser - Los Angeles, Cal. The new home of Budweiser, King of Beers, is on a 65 acre site in the San Fernando Valley. The brewery is built to duplicate every phase of the brewing process at St. Louis. Capacity is 1,000,000 barrels annually. It wasn't the first brewery in Van Nuys. There was the Schlitz plant on Woodman just south of Saticoy. I grew up across the street from it.